Tarps are water resistant coverings that are typically made of a strong and flexible polyester material. If you require a covering with particularly large dimensions, inquire about our selection of polyethylene sheets. These sheets are particularly durable, and will see years of use before they begin to degrade, making them an excellent and economic choice for your sheltering or cargo restraining needs. Your typical tarp will always come equipped with reinforced grommets lining the sides and sturdy tie-down points at their corners, making it easier to secure both the tarp and the cargo it may be helping to keep in place. 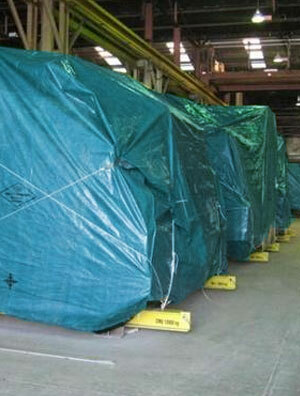 To this end, tarps and tarp tie-downs are integral to the cargo and transportation industries. At the same time, they also find a place in commercial and entertainment settings, as they can provide cover for outdoor events and gatherings. While camping, you will often see blue tarps being used as auxiliary tent flies, or makeshift shelters. Tarps can be used to protect masonry material from the elements during construction projects, and can even be used as drop sheets while painting. Large tarps are available in sizes ranging from 40’x60’ to over 100’x100’. If you are looking to secure goods and cargo, we recommend our brown super-heavy-duty tarps, which contain a maximum weave and a thickness of 0.41mm. On the other hand, if you are simply looking to create a water resistant shelter, we recommend our blue tarps, which are the lightest and have a thickness of 0.14 mm. We have the tarp tie-downs and fasteners you need to complete the job. Tarp tie-downs include bungee balls, tarp straps, shock cords, and hooks. These also come in a variety of strengths to meet your requirements. Tarp straps, including adjustable straps, are available in regular duty, heavy duty, and economy quality. When it comes to tarp shelters and cargo strapping, Hoffmeyer has you covered. We have been a part of this field for over 90 years, and we’re more than qualified to meet your every need when it comes to tarps and tarp tie-downs. Contact the Hoffmeyer representative in your area and we will find you a tarp that lives up to both industry standards and your own.